Länsimetro’s new situation centre engineer Joonatan Piela sits in a room where the walls are covered with situation information of the Metro construction: the progression of Länsimetro’s five stations, depot, rail line, and side projects is represented with colours familiar from traffic lights. The job of Piela, who started in the project in mid-April, is to track the progression of schedules and keep the information of the situation centre up to date. The information of each station and side project is updated at least once a week; the progression of, among other things, planning and permits is depicted on the walls. The situation centre of the Länsimetro is currently expanding, Piela has jumped into the middle of a development phase. “It is great to be creating something new. I am learning a lot here myself also, but on the other hand I have the opportunity to put into practice the subject of my Master’s thesis,” says Piela. Piela graduated as a Master of Science from the Lappeenranta Technical University in 2017 majoring in Industrial Management. 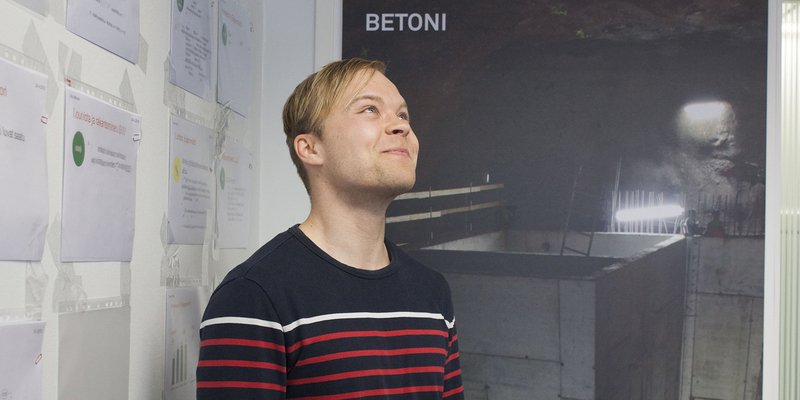 In his Master’s thesis he concentrated on measurement and visualisation of KPI- or key measurements. During his last years of study Piela worked closely with Destia Rail, where he was involved in the project for Länsimetro’s first phase rail line. The work included, among other things, accounting, invoicing, and quality documentation. After graduation Piela worked at Destia Rail full time as a development engineer tracking cost data and KPI-measures. “After graduation I wondered which direction to head, and when I saw the advertisement for the position of situation centre engineer I became interested. I knew the project from previous work, and the job description fit my own know-how,” says Piela. As the situation centre engineer Piela handles a huge amount of data and gathers it in one situation centre. The data is gathered from the systems used by different projects, and at times Piela also participates in meetings in which he receives new data for the situation room. “Large amounts of data are becoming more important in all kinds of business in the future. I believe that this job will give a good foothold in project management, as well as in the world of tracking measurements and schedules,” says Piela.